Functional Wisdom...healthy updates from Dr. Jill! : MTHFR gene mutation... What's the big deal about Methylation? Functional Wisdom...healthy updates from Dr. Jill! Healthy Updates from Dr. Jill, Your Functional Medicine Expert! MTHFR gene mutation... What's the big deal about Methylation? Do you have a genetic defect in the MTHFR gene?? Maybe you've have a family history of heart attack or stroke... maybe you've suffered through multiple miscarriages. Or maybe you struggle with chronic migraine headaches or irritible bowel syndrome or depression. Perhaps your child or a sibling has autism. What do all these things have in common? Well, these are just some of the conditions liked to a faulty enzyme called MTHFR. MTHFR stands for methyl-tetrahydrofolate reductase, an enzyme that is responsible for the process of methylation in every cell in your body. MTHFR is a common genetic variant that causes this key enzyme in the body to function at a lower than normal rate. This can lead to a variety of medical problems. Although there are over fifty known MTHFR variants, the two primary ones are called C677T and A1298. Your doctor can order a blood test to determine if you have these genetic variants. Better yet, you can order a complete genetic profile yourself through 23andMe. What's the big deal about methylation? The 677T variant is most commonly associated with early heart disease and stroke and the 1298C variant with a variety chronic illnesses, but either anomaly can cause a wide variety of health problems. The MTHFR anomaly is reported out as heterozygous or homozygous. If you are heterozygous that means you have one affected gene and one normal gene. Your enzyme activity will run at about 60% efficiency compared to a normal. Glutathione is the body's primary antioxidant and detoxifier. One of the ways that MTHFR gene mutation can make you susceptible to illness is by lowering your ability to make glutathione. People with MTHFR anomalies usually have low glutathione, which makes them more susceptible to stress and less tolerant to toxic exposures. Accumulation of toxins in the body and increased oxidative stress, which also leads to premature aging. Fortunately, you can easily be tested for the MTHFR mutation. If you find out that you have one or more of the gene mutations, you can supplement with methyl-folate and methyl B12, the active forms of these B vitamins. You can also supplement with liposomal or acetyl-glutathione, the end product of the pathway. Glutathione is poorly absorbed so either the liposomal form or a precursor, called n-acetylcysteine (NAC) may be used. Some of my favorites are Thorne Research Methyl Guard Plus and 5-MTHF 1mg and 5mg. There are prescription medicines, that also contain methyl-folate: Deplin, MetanX, CerefolinNAC are a few. Methyl B12 can also be given as shots, nasal sprays, and sublingually. The intramuscular shots are by far the most effective method and must be prescribed by your physician. The choice of nutrients will vary from patient to patient and should be done under a doctor's supervision. There is a bell-shaped optimal curve so you may not feel well with too much or too little of the appropriate supplements. Other B vitamins, such as riboflavin and vitamin B6 also play an important role. As you may have surmised, this can be quite complex and I suggest you find a functional medicine trained physician to help you sort through your needs for the different nutrients if you have a chronic health condition related to the gene mutations. It is not uncommon for patients with these genetic polymorphism's to be very sensitive to supplementation. If you are interested in knowing more about your genes, the 23andme gene test will be the best $99 investment you've ever spent ! Want more great content like this? Sign up for my FREE Newsletter here! Thanks for the great information. I have many patients affected by these mutations. Thank you for being a good doctor! My doc treated me for allergirs for 7 years...even after i went to an allergist and ruled out allergies. He always struck me as a glorified oharmacist. My current doctor figured this stuff out. Allergies? This can cause false allergies? I'm about to cry! 5.5 year's ago I found out I had MTHFR, and they told me it was no big deal just take a baby aspirin while pregnant. Both of my kids are coming up with allergies galore! My 2 yr old has growing problem that we have thought were due to food allergies. The only reason why MTHFR has come up is because I was turned down to be a surrogate mother. Now I'm going to have both of my kids tested. I just found out I have heterozygous MTFHR C677T varient one copy. I have chronic lymes, chronic fatigue, and get angry easily. I also had vertility issues among many other things. My daughter is 3 and has celiac and EOE. She also has chromosome abnormalities on no significance along with elevated pyruvate and lactic acid. No docs can figure out what is causing her speech and gross motor delays. Could this be the missing link? Also what are my risks with this and can I simply take folate to correct it? Unfortunately just adding methyl-folate won't fix anything. The MTHFR just predisposes you to more trouble eliminating toxins, repairing DNA and getting the right nutrients. You really need to consult with a functional doc who can test and treat all underlying imbalances in a personalized manner and help you on the road to wellness! This is a test I can order (as a functional medicine RD). I used to order it more judiciously but as they all kept coming back positive for one or more, I now do it as standard practice. I've only had 2 patients who are negative for all mutations. It's been quite a finding and has made a significant difference for many many. Wow. What a big prevalence! Sue, I am honozygous for 677T and 1298C as well. Strangely enough, my brother also died at age 42. He died from aortic aneurysm at the heart. I have been diagnosed with fibromyalgia, chronic fatigue, migraines and a host of other issues after taking lupron for my endometriosis. I am trying to find out if there could be a link to what happened to my brother and MTHFR mutations. Having his kids and my kids and parents tested for MTHFR and trying to figure out what to start with. My oldest is autistic and two of my three kids had heart defects and one was on ECMO as a baby. I can't help but think this is somehow related. If you have one copy of each, you are heterozygous. Otherwise, instead of the standard 2 copies of the gene, you have FOUR copies of the gene, which would be beyond unusual. No. The numbers 677 and 1298 indicate locations on the MTHFR gene, not the gene itself; therefore, the copy of the gene you receive from your mother can be normal or defective at each of those locations. Likewise, the copy you receive from your father, so it is possible to be homozygous for both 677 and 1298. People with COMT mutations often are sensitive to excess methyl groups because they degrade them slowly. Often they need to use hydroxycobalamin instead of methylcobalamin. Also, people in stressed health can oxidize mB12, and hydroxyB12 can be helpful then. If your side effects from metafolin go away when you take niacin, which eats up methyl groups as it metabolizes to SAMe, that could indicate your having problems with too many methyls. It's possible you might be able to substitute folinic acid (not folic acid) to meet your active folate requirement. 1298C's can process folinic acid. Hi Doc Carnahan, for some reason, 23andme is not doing medical gene testing any longer. They will do gene tests for ancestry purposes, but not for health issues. I wish they did. Do you know of any other fairly inexpensive place to get this done? These mutations, since they can cause bad thinking, (eg irritability, anxiety, depression, schizophrenia, addiction) oftentimes leads to poverty and, as I think about it, many low income folks have maybe been consigned to a life of bad decisions, fighting with family and the inevitable poverty as a result of these awful mutations. So they really need to be able to get this test the most. And, as such, it needs to be affordable. Great post! These tips are really very useful for maintaining skin.I will surely follow these tips.Thanks for sharing with site visitors. I live in Peoria Il...what doctors are in the area that could help me with treatment of the MTHFR mutation...been going thru unexplained hell for the last 2 years and my nurse practitioner discovered this mutation but does not have experience in treating it. Have been trying to get an appt with Dr. Akwa which is proving to be challenging...anyone else you would suggest? Something I was wondering about...didnt really have any symptoms until after my hysterectomy...is this unusual?! 39 now...and would hate to think I am going to feel like this for the rest of my life. I have 2 daughters who must have the gene mutations. There are different tests. The difference, I believe, is others give an explanation of the test. I live in Boston, so will a good natuapath who knows the mutations be able to explain the test results? Dr. Carnahan, after doing a fair bit of reading online (dangerous, I know) it seems to me there is a fair bit of connection between the effects of the above named MTHFR gene mutations and adrenal fatigue. Do you know if there has been any research exploring this connection? Well, yes in a round about way. 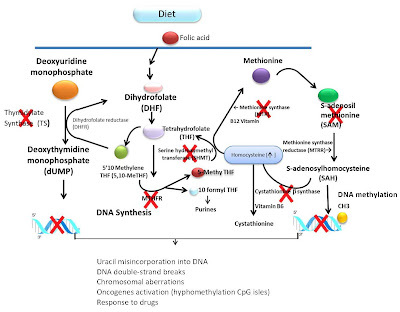 Poor methylation leads to poor detox and sometimes issues with eliminating infections or GI imbalances. All of these thins are stressors on the body and will drain the adrenal glands, especially poor detox. Hello, I tested heterozygous for C677T today after my sister informed me she tested positive last week. I am 32, have had psoriatic arthritis for 4 years and also have a lot of anxiety and chronic fatigue. Do you believe there is a link to all of this being due to this mutation? I havent been able to find any reliable information linking this to autoimmune conditions. Any information provided would be greatly appreciated. My husband and I are both negative for C677T, but both hetero for A1298C. We have three adult. Also family members live well into their 90's. I have anxiety and insomnia but testing indicates narcolepsy, which is never for me. Will have sleep study soon. We cleaned up our diet about five years ago and both have hypothyroidism. Both gluten sensitive and other food allergies. I catch every new cold that my grandbabies have. we are in our mid 60's and enjoy good health with exercise and plenty of water with lime, no diet drinks, no fast food. Dr. Carnahan, you write above "The worst combination is 677T/1298C in which you are heterozygous to both anomalies." Do you mean homozygous rather than heterozygous in this sentence? I suggest finding a functional medicine trained physician in your area, try searching at www.functionalmedicine.org by zip code. I know you may have already gotten a good doctor in your area but if not you might want to try Dr. Minna Kim (www.stamfordnaturopathic.com). She treats patients w/ MTHFR, but she is an ND not an MD. Try the Avena wellness center in Putnam CT.. place is awesome! I tested positive for A1298C only. what should i supplement with? my holistic md does not know. thank you for your help. If my sister is positive for both A and C and my half sister is also positive, and I suffer from many symptoms of MTHFR is it okay to just try the homocysteine factor supplement for six months or should I test first? Or is it most prudent to test first? Money is the concern. I have the MTHFR A1298C variety. I've had depression since childhood. In my 30's, after having two babies, I began getting FM/CFS symptoms which have continuously worsened over the yrs. I am now 52 and so sick of being sick. I tried Deplin for a couple of yrs, methyl b12 shots at home. Numerous supplements, alternative treatments, rx meds, you name it. Nothing seems to help at all. I'm thinking I need to revisit info like this on MTHFR, maybe now there is more info and treatment ideas. Any info would be greatly appreciated. Thank you! Recommend getting 23&me testing and then analysis of SNPs and seeing a functional medicine physician who understands these and knows how to treat. Best of luck to you! Hi I had a pe in oct 2012. I was tested for mutation and it came back that Im positive for mthtr c677t . I have unknown reason for the pe. Ibeing in coamadin for a year now today is going to be my first day out of medication. I don't want to be on warfin for life . What are my chances of another pe .taking the fact I have the one mtfhr c677t. would homogenous mthtr c677t result in high c reactive protein? thanks for the reply, not sure what is causing my high crp?? neither does my functional PCP and I was just found to have this gene disorder. THANKS! I'm trying to help my sister who has the MTHFR A1298C and advanced Parkinson's. We need a doctor in Florida, anywhere between Miami and Palm Beach. We're familiar with several of the doctors on the functional medicine doctor list, but they don't seem to have in-depth knowledge on treating methylation defects, amino balancing, handling other genetic issues, detoxing, etc. Are there doctors you could recommend that have experience with Parkinson's and the above that I mentioned? If you don't know of anyone in that area, would you be able to suggest someone who would work with her by phone? Thanks so much. Thank you for your questions... I suggest seeing my colleague, Dr. Perlmutter in Florida, who is an expert functional medicine neurologist (http://www.drperlmutter.com/about/perlmutter-health-center/). If that does not work out, I do phone consultations but prefer that patients come in for initial visit in Boulder, CO. Thanks for the quick response. My sister has seen Dr. Perlmutter. She is receiving glutathione IV's regularly. His current focus is getting her on the cinemet, which she can't handle because of side effects. He did not focus on the methylation defect, only mentioning that he didn't think it was a cause of her problem with tolerating the L-dopa products. My sister is unable to travel in her current state of health - would you know of anyone else in Florida who might have that type of knowledge? What can I expect if I have this test done and sent the results to a normal specialist physician / GP? We do not have many functional medicine guys in Mpumalanga South Africa. Depends... I believe patients are their own best advocates so the more you learn and equip yourself, the better! Learn as much as you can and take the information to your doctor with suggestions and perhaps the two of you can work together. In fact if he is open minded, you might just enlighten him! I am currently being treated by my ND for topical steroid withdrawal. I used topical steroids for eczema for over 30 years. An MD in CA has researched this and states some atopics become addicted to the steroid creams and the only cure is total cessation from them. I am currently 9 months free of the creams and was told it might take up to 3 years to stop withdrawing. My skin has been a disaster and I was out of work until recently. My ND put me on 5-MTHF, liposomal glutathione, MSM, and NAC. After researching I realized he was possibly treating me for the gene mutation. Have you ever come across this in your research? I plan to get the DNA testing once we move out of NY (23 and me cannot process samples out of NY state), I do not have any other gene mutation issues other having severe post partum depression. All I do know is my skin is significantly better since being on these supplements and I am able to work again. There are many others out there like me suffering from this steroid withdrawal. I would like to know if it is possible that we suffer as badly as we do because of this gene mutation and not being able to rid the body of the toxins in a more timely manner. Thanks for sharing your story, Tracy! That is great news that you are doing so much better! Hello there. I would suggest the 23&me test for you as well. I also suggest finding a doctor trained in functional medicine in your area who can help you navigate the results. Thanks for the information! Can you recommend a functional medicine doctor in the Bay Area? I read the 23andme terms and conditions. Where or how can I find out if it is legal to sent silava from South Africa to Califorina? My 8 week old son has a diagnosed tongue tie as well as a lip tie and umbilical hernia. Through a breastfeeding support group I was referred to a tongue tie support group where I first began to see the connection between midline defects and MTHFR mutation. Worried now about continuing vaccinations and starting solid foods without knowing more. Do we test him? If so what for? It maybe of interest that I have RA (vs. Psoriatic arthritis) and my son had a concave chest at birth that seems to have resolved for now. What brand Methylcobalamin sublingual do you recommend to your patients? Have C677T and B12 deficiency that has been diagnosed Pernicious Anemia. Have been trying the liquid Methylcobalamin 1000 mcg under tongue daily. Causing my tongue to feel funny, dry mouth, neck and shoulder pain. Think perhaps a sublingual would work better for me? What doseage do you typically recommend if serum B12 level is now eithin normal range? Just found out I have this genetic mutation. My psychiatrist ordered it and my doctor knows nothing about it. So I have no idea which mutation I have or what to do about it. I've had muscle/joint pain, idiopathic angioedema, extreme RANDOM allergies, anxiety, depression with psychotic features, constantly sick, ect for many many years. Since my doc has no idea what to do about it I certainly don't either.. I'm in the Chicago area.. any thoughts as to what I should do from here? Hello, reviewed more than a few forums, and can't find my answer yet. I have RA, and with my Methotrexate, as is standard practice,I take 3mg of Folic acid daily. I tested heterozygous for A1298C, and changed over to a methyl-folate 440mcg, and a methyl B12. After about a week, I have noticed an improvement in my hypertension, so was thrilled. What I have been unable to find yet is, would I work up to the same dosing of the methyl-folate as the standard Folic acid? Thanks for this forum, found it helpful. Even if you know your genetic SNPs, like A1298C, each patient is different. I would start slowly and work your way up to 3mg methyl-folate but watch how you feel and your other symptoms. You should be able to find a "sweet spot" where you feel great and dosage between 1-3mg daily. It is very common to need a slightly higher dose for the first 1-2 mod and then less to maintain. Is the "raw genetic data" enough? The FDA has a responsibility to ensure the health and safety for all consumers. The decision they made to prevent people from obtaining their genetic information is to ensure that the patient is working with a qualified physician. Genetic anomalies are so vast that they subject a patient to a plethora of conditions. Apart from working in conjunction with an MD, there is the risk of self-treating, self- diagnosis which may pose a great risk. The decision to prevent a person obtaining this information ensures that they are properly diagnosed and properly treated. The FDA has no means to monitor the release of medical information obtained in this manner for accuracy. Given the fact that these tests are for genetic issues, it is even more critical that this type of testing be monitored by a pediatric specialist to ensure that children are properly diagnosed and properly treated. Obtaining a ones' medical history or any kind, including genetic history, is a right that should be available to everyone. (except in extreme cases, such as in the case of a serious mental illness that is not well managed- laws permit mental health professionals from forcing the release of such records when there is just cause to do so when it poses a safety issues). It simply needs to in conjunction with a person's physician for reasons stated above. Just another example of government overstepping their boundaries to protect us from ourselves. Dr. Carnahan, my daughter who is 28 had two miscarriages and insisted upon checking for this mutation. She does had the most severe form of it. Last week she suffered eye pain, and visual loss which they are saying she has orbital neuritis and are sending her to a neurologist for further workup for MS. Her Head MRI showed no lesions at this time. Do you think there is a link here and also who would you recommend in this area. We live in South Carolina. Murrells Inlet,SC. Thank you so much for your advice. I recommend my colleague, Dr. Cynthia Libert in Blairsville, GA (http://drlibert.org/aboutus/cynthia-j-libert-m-d/) You can also search for functional medicine trained docs at www.functionalmedicine.org. Dr. Carnahan, I have recently had some blood work done and it revealed that I am homozygous for MTHFR Mutation A1298C. My levels for homocysteine were low (normal 5 umol/L) my Factor VIII was 183%. Your baseline risk was likely higher than average due to the mutation but the surgery was a definite risk factor as well - likely a combination of the two. I have been reading the mutation causes your body to not produce neurotransmitters. Is taking an SSRI moot having this gene or is it a good thing? Doc wants to up my Cymbalta. Thanks! I am 51 years old and I am suffering from Chronic Migraine Headache, Thyroid - Hashimoto, Meniere's, Fibromylgia, Candida and suspect of Lyme. I eat very healthy all my life, never smoke, never drink, never take any drugs, very atletic before and I got all these. Is been four years since I am in menopause and from that time my health is very bad. I am exhaustion because the pain of migraine and the pain every where in my body,the nausea and the dizziness. After I changed many doctors because they told me that the symptoms are in y head, my new doctor find out that I am positive with C677T. I heard that taking thyroid hormones together with medication for MTHFR can cause very bad side effect. Also my doctor put me on Estradiol because the menopause. I have not taking any medication yet for MTHFR which are: methylcobalamin 5mg, 5-methyltetrahydrofolic acid 800mg, P-5-P 50mg. The only medication I am taking now are : Armour 60 mg, Lumbrokinase 20mg, and lot of vitamins (not folic acid). I so worry to medication because I get bad side effect from the synthetic medication and same minerals. Also, I order ZEOLITE to detox my body because I have very high level of mercury and it doesn't have side effect. I really appreciate if you can tell how can I start taking all these supplements and I have to cut the dosage because the side effect. Hi there, Your medical history is complicated and you really need to find a good functional medicine doctor who will help you sort through these questions. If you have not done so already, you can search by zip code at www.functionalmedicine.org. In my humble opinion this remains a very poorly understood phenomenon and much of the information online, from practitioners who purport to treat it and otherwise, is inconsistent and not yet supported by sound science. I myself have seen a couple of supposedly very good functional medicine doctors as well as two very highly rated naturopaths and their recommendations were wildly divergent. The more I go down the road, the more I think that except for very well-defined diseases and even then, people would be much better served by eating a really clean diet and reducing their stress levels than by placing their faith in supplement regimes. My two cents. Hi Pete, thanks for sharing your opinion! I agree with you that diet is absolutely core in getting well and usually about 80% of the treatment. This is a relatively new field and so not all docs are equally qualified to make recommendations for successful treatment. However, I still think that the genetic testing can be very useful in the patients who has complex chronic disease. I appreciate the response, and perhaps you are the exception to my view of functional/integrative/alternative medicine doctors, but even with a fairly straightforward situation (homozygous a1298c but none of the other problematic methylation SNPs one reads about), I can't seem to get a coherent recommendation. For example: you need more testing (although I already have spent tens of thousands of dollars on many of the tests beloved by the alt med world). Take Deplin. 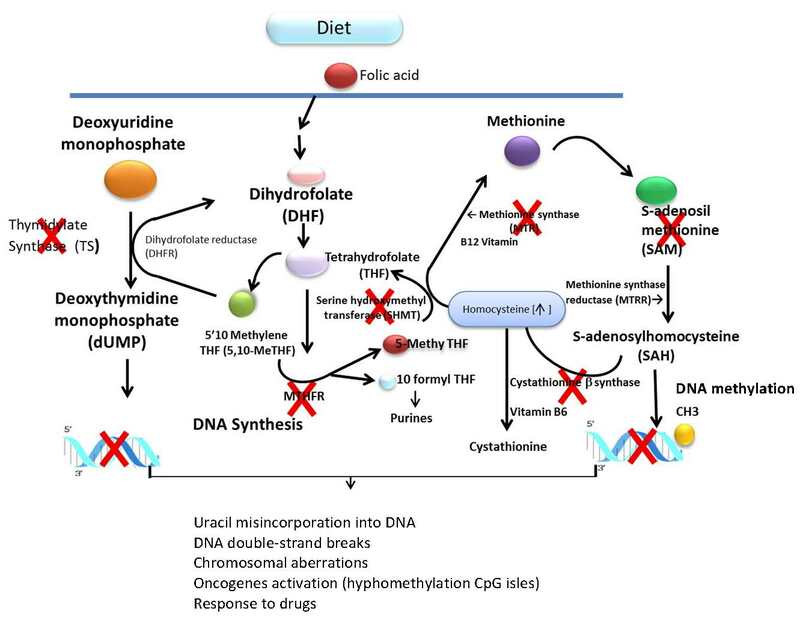 Deplin is way too much methylfolate just eat leafy greens or take a very low dose. Take hydoxycobalamin not methylcobalamin. Vice versa. Don't take B12 at all your levels are already high. Etc. Hi my 5 year old has thick lining of the bladder and hydronephrosis of both kidneys, with macrohematuria present (in either Kidney or bladder, they are not certain) the last time he was admitted into childrens hospital. They had hemotology come in and run a full blood work up. On my follow up visit with Hemotology they said all blood work came back normal. However I requested medical records to provide to another doctor for a 2nd opinion. Going over the records myself I found that is was noted that he tested positive for homozgous MTHFR C667 mutation. Nothing has been said to me and I am furious that it hasnt. I also have an 11 year old with ADHD and asbergers. I will look into getting her tested as well. My mother in the last 5 years suffered a suberachnoid anyurism and several strokes. My mother in law has horrible IBS and my brother in law has Cardiomyopithy . I dont know what to do or where to go at his point, and am devistated that Hemotology specialists at Childrens Hospital Orange County dont see it of any improtatnce to let a parent know that the child is Homozygous ! There is no doubt a connection between these genetic SNPs and your child's health issues. However, many doctors are unaware of the significance of these mutation. Methylation involves detoxification processes, DNA/RNA repair and neurotransmitter synthesis so it can affect many areas of health. I suggest finding a doc trained in functional medicine who understands testing and treatment of SNPs. Do you have doctor recommendations for Houston? Yes, indeed and many docs don't understand how the MTHFR mutation affects many aspects of health - wishing you health and healing! So glad to see this comment thread as active. I'm wondering if you can point me in the direction of babies and colic in relation to this mutation. My 7 month old has a string of midline defects: upper lip tie, umbilical hernia, colic (severe). Apparent food intolerances (dairy, soy, corn & maybe gluten) and absent reflexes that required OT intervention. (Spinal galant, atnr, sucking) Although she is mostly happy now her severe reflux when I mess up my diet (breastfeeding) has me concerned. Family history includes MS, dementia with luei bodies and diabetes. According to 23andMe I'm compound heterozygous, and I have Parkinson's. Confused about how much to supplement with methylfolate & methylcobalamin, worry about possible over-methylation. Doctors say my folate & B12 levels are fine. Anyone you recommend in Oakland CA or SF Bay Area? Many thanks. My son is 17 years old diagnosed with POTS three years ago and debilitating abdominal pain and constipation. In your list of conditions POTS is not mentioned but other autoimmune diseases are. It sounds like it would be a good idea to have my son tested. Do you have a doctor you could recommend in the Washington,DC area which is also close to Virginia (where we live) and Maryland. Thank you so much for this valuable information. Can starting on 1mg 5mtfr cause headaches and lower back pain and body aches in the morning? My lab came back heterozygous c677t. The only thing my doctor put me on was 1mg 5mtfr. I have had high toxin labs come back in the past also. Is there something else I should be taking? Ive never had pain before. Its been less than a week since starting this and my whole body aches in the mornings. Also, can this gene mutation cause hair loss? Ive had unexplained hair loss for 10+ years. Hi Randy, many people are very sensitive to methyl-folate especially if they are also B12 deficient. I rarely start patients on even 1mg until I know their other genetic SNPs and have made sure they tolerate B12 first. Safest way to get active folate if you are sensitive to the supplements is in raw leafy green, like am smoothie with lots of spinach. Hi Jill, I was under the impression that folate from food/greens was also difficult to absorb as it still needs to be processed by mthfr but that methylfolate bypasses it? My Name is Mary. I tested positive for one copy of the C677T Mutation and my ND/RD told me to take Folapro daily. Is this the best remedy for this condition? Is there anything else I can do or take to stay healthy? Can you recommend a MD in CT that is knowledgeable about MTHFR. It is all confusing to me. Also should my siblings, Mother and Son be tested as well? Any advice or help on this is greatly appreciated. Mary, I too live in CT and go to Ct Natural Health (naturopaths) in Manchester and they do take many insurances. Another good one is Dr. Frank Aieta, although he only takes two insurances. I am heterozygous for C677T and A298C. My doc put me on Deplin. What is the function of methyl folate supplementation? Does it actually bypass the effects of non-methylation? Is supplementing with glutathion also a good idea? Methyl-folate bypasses the MTHFR enzyme that has decreased activity in those with genetic defects. Recommend using caution when introducing high dose methyl-folate as some people do not tolerate. Hi, I just found out today that I am positive for homozygous 1298C. The reason I took the test was to find out answers for back to back pregnancies with birth defects. The first baby had hydrocephalus and this past pregnancy the baby had hydrocephalus AND Spinal Bifida. I am young, 32, eat extremely healthy and clean and I had a little girl 4 years ago with no problems. Today they tested my homocysteine levels and I am anxious for the results. Ever since I left the drs I have been googling about MTHFR and the 1298C mutation. I don't have any of the symptoms listed. I do suffer from insomnia from time to time. But besides that I don't have any other symptom. My question is what is the next step and could this mutation have caused the birth defect in both of my pregnancies? The defects were severe and both pregnancies were terminated:( I have never had a miscarriage. Also, since I have it and it came from each of my parents, would that mean my sister would have it too? What about my daughter? Hi Kristina - yes folate metabolism & methylation may contribute to birth defects. Please find a knowledgable doctor in your area to help you and get your family tested, too! Hi Oscar - there are many great options for you! - search www.functionalmedicine.org for a trained physician near you by zip code. Hi, I am heterozygous for both 677 and 1298. You stated that homozygous on one or the other means about 10% enzyme working rate and heterozygous for one or the other means about 60% enzyme working rate. What is the enzyme working rate for me? (heterozygous for both 677 and 1298) Does that mean that each of my enzymes works at 60%? Great question, I'm afraid I don't have the data on statistics for double heterozygous mutations. Thank you for your response. Do you know where I can find it? I've searched the web. It would be helpful to know what my body is doing. Hi! I'm homozygous c677t - Im taking methylguard-not plus (1.2mg) and thorne pre-natal (1mg) - am i getting enough methylfolate? Also, how would I know if Im under or over methylated? I know each case is different, but as a general rule - whats either a good amount to be on, or a good place to start? That sounds appropriate. Each patient is individual and while some people react to as little as 1mg of methyl-folate, others need much higher doses. If you are feeling well on your current regimen, that is a good sign. Another way to get folate is through dark raw leafy greens. Thank you so much for your quick reply! Justa quick follow up; What are some symptoms of too much methylfolate? I'm undergoing fertility treatments so it may be hard to discern whats what - but if I knew what to look out for it would be incredibly helpful. Thanks again! Please find a functional medicine doctor to help you! As you know this can be quite complex and you need an advocate who understands how to treat your unique physiology and genetics. I've posted before but search www.functionalmedicine.org for a practitioner near you. DO you recommend a baby aspirin daily for those individuals with homozygous status for C677T? Do you know what the mechanism is that causes MTHFR mutations to lead to migraine with aura? Is there a direct relationship between MTHFR defects and undermethylation? Do you have any colleagues you would recommend in the state of New Mexico? I did browse the list at www.functionalmedicine.org, but wondering if you have a personal recommendation. I'm looking for someone good to interpret and help with my 23andme.com snp's. Hi. I'm compound heterozygous (677 and 1298) and have had anxiety & horomone/mood issues for years brought on by severe stress, but no other serious illnesses. I have been taking Vitaprime with methyl folate (400 mcg) and methylcobalmin (50mcg) for a couple years off and on. My doctor explained MTHFR vaguely a few times in the last couple of years but until I developed LPR reflux, gastritis, digestive issues and throat spasms this past summer after a lot of stress, I didn't think much about it. My doctor (DO who specializes in autism) doesn't seem to think I need to get SNPs tested and increased my dosage to methylfolate 1000 mcg and methylcobalmin to 1000mcg. I'm going slow with 650 mcg a day mfolate but my doctor doesn't think it's necessary. I seem to be ok on the 650 mcg taken in 3 doses during the day. My issue is the methylcobalmin. I attempted 1000 mcg and felt out of body weird. So, I have been taking 500 mcg (plus the 50 in the vitamin). I have been fine on that for a couple weeks so I increased again to 1000 mcg and the last couple days have been lethargic off and on, feeling rundown, dizzy, weak, and flulike off and on. I just sent away for 23 and me testing but was weighing the Yasko vs the 23 and me. My question is, can the B12 be causing my issues with detox? I also have LPR still and reflux with throat spasms and increased congestion. I'm trying to wean off the Nexium but the burning in my throat comes back and we just got the swelling down with a low acid/low histamine diet and Nexium and Dymista spray. I never go for meds but over the summer I was vomiting so much for a month and a half after getting food poisoning or something that they couldn't diagnose that my DO put me on Nexium which stopped it. I'm negative Hpylori, normal B12 serum and folate serum levels, normal homocysteine (around 6) and CBC blood test is normal, although my vitamin D is a bit high since I take 5000 IU's a day. (Doc wants me to stay on this). The only thing that is high is B6 (2.0-36 is normal and mine is at 91.9). My doctor says not to worry about that unless I get tingling in my back and lay off the sunflower seeds that I've been eating a lot of on my modified diet. So, bottom line, is B12 capable of causing detox reactions off and on? Perhaps how it interacts with the methylfolate? Also, is 23 and Me adequate enough for SNP's or is Yasko better? I came across all this information after being prescribed Deplin to help my anti depressants work better. I am in shock. I have or have had so many of the symtoms, including MS, Fibro, depression, Endometriosis, miscarriages, IBS, it is unbelievable. I have sent for the DNA kit. I live in the Houston area. If I do have the mutation can you suggest a knowledgable doctor in this area? After reading this, I immediately went to the 23andMe website and they state they don't do any health related testing. Hi Annie - they still do testing and report raw data which is all you need to get info on all your methylation SNPs. You just don't get the fancy online report from 23andme, which is not that important anyway. Hi Brenda, please email me through the "contact us" link on my website - www.drcarnahan.com. I will see if there is any way we can get you in sooner! Do you know of any doctors in the Milwaukee area who might be helpful? My sister developed type 1 diabetes during her pregnancy (5 years ago now) and has had severe MS type symptoms but all testing ruled out MS. She also had uveitis. She has seen several physicians trying to understand her symptoms but has been left without answers other than that it is in her head. I have been diagnosed for Lyme Disease, Chronic Fatigue Syndrome, IBS, colitis and now have discovered I have both the 1298C mutations. My father died of an aneurysm - we believe- at the age of 58. He was in great health and died overseas so we really can't confirm exactly what happened. My twin sister has Hashimotos thyroid disease and van willebrands. And we all suffer from food sensitivities, specifically gulten intolerance. I can't help but think that there is a connection with this MTHFR mutation? Thanks! I found out a few weeks ago that I'm C677T homozygous. My Dr. (actually a FNP) started me on Methyl Protect by Xymogen, and it caused ridiculous insomnia and more migraine headaches (than I normally had been getting). I pretty much couldn't function and asked if we could do other testing (COMT, CBS, etc). There seems to be so many variables in determining side effects (other SNPs, potassium, zinc, hydroxy vs methyl cobalamin, etc.) My Dr. stated she's unaware of the other tests and would't know how to order them. Do you lean towards a specific protocol (Yasko, Dr, Ben, etc)? I've gone gluten/dairy free to start healing the gut. Would love some help on next steps. Excellent first steps, John. 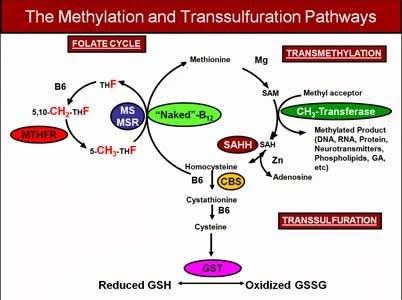 I do find many people with methylation defects need methylfolate but unless other pathways are balanced, simply giving a supplement with methyl-factors doesn't always work. Start with low-dose methyl-B12 and you may want to get a nutritional profile, like Genova Diagnostics ONE to assess your other co-factors, like riboflavin. My son has been detected with homozygous 1298C Gene Mutation. C667T is fine. He was diagnosed of Autism when he was 17 months old. He is now 3 years old. He is on MB12 shots of 1.23 mg or 0.05 ml, per injection, Alpho Lipoic Acid 200 Mg/ day, Calcium Folinic acid 15 mg , Admenta 5 mg/ day + all his vitamins and supplements. We are currently residing in India and need you expert advice and guidance with my sons medication. This is unusual for me to ask medical question on a blog, but I am running out of answers and doctors who will listen. I was told I am hetero A1298c and went to see a specialist who informed me it was nothing to worry about unless I had a blood clot before the age of 30 (I am 32). Everything I read online tells me there is much more to worry about. My mother had two forms of cancer, my brother has a rare disease, and although I have had 5 children easily I have been unable to maintain a pregnancy for the past year (5 miscarriages). I will be consulting with a genetics specialist in the next week, but what other steps should I be taking? Any kind of help would be appreciated. (I know you cannot do a full diagnosis or anything similar, just looking for some advice.) Thanks! I am a pretty healthy eater, but I could definitely improve! Is the doc right in his comments that I have nothing to worry about with this mutation unless I had a blot clot before the age of 30? Personally, I have a pretty healthy med hx. Everyone is talking about the 677 and 1298 mutations but I have Compound Heterozygous C655T and A1286C. I have no idea what that means. The doctor (not a functional medicine doc) who did the test recommended I take 1mg "activated" folate and 1000mcg of "activated" B12. Because I'm so sensitive, I thought those amounts seemed high, so I chose to use Thorne's B-Complex #6 instead. I took it for a week, and did not feel well, so I stopped taking it. At this point, I'm completely confused and distraught. I have no idea what I'm supposed to do. Thoughts? Is methycobalamin generally the preferred form of B12 for people with a1298c (homozygous)? This certainly seems to be the majority point of view but I also see recommendations for hyroxy and adeno forms. It's very confusing!! Hi Pierre, it depends on many factors, there are specific indications for each form. For example if you have high nitric oxide levels, then hydroxycobalamin may be better then methylcobalamin. I have been suffering with chronic lyme disease, migraines and sever fatigue for more then six years now. I have treated with many antibiotics, as well as homeopathic supplements and remedies. I never fully recovered but did get somewhat better after three years of treatment. This past November I suffered a terrible relapse/reinfection ( not sure which) I just know I am terribly sick again. I am working with an LLMD, as well as a naturalist to treat my Lyme once again. I am still very sick, and very medication sensitive, as well as very sensitive to many foods now. My LLMD suggested this mutation to me at my last visit, and I just received the results today, I am positive for the C677T heterozygotes. I am already following a very strict paleo diet, and taking many supplements. What would you suggest I do at this point? Unfortunately, this is not uncommon with lyme disease. I suggest continued work with your LLMD and/or consulting with a functional medicine specialist. Wish you health & healing! I recently did the 23 and me test and found out that I am homozygyous for the MTHFR 677t mutation. I have had hashimoto's for 10 years, have suffered from OCD my entire life, and had two miscarriages this year. My OCD has been manageable with zoloft and cognitive modification therapy I did in my early 20s. I have a healthy 4 year old that I conceived at age 37 with absolutely no problem and had a wonderfully easy pregnancy. At 42, it's not as easy. I found an MD who is going through the process of certifying her office as a functional medicine office and met with her nurse practicioner this week. The recommendation was to take deplin. My choice of 7,5 or 15 mg. There was no mention of additional supplementation of methlycobalmin or B6. Since I am trying to conceive, I am concerned about just supplementing with deplin. Despite my repeated concerns about this, the nurse practicioner says, just deplin is necessary. I started the 7.5 mg dose this week and no ill effects yet. I also bought the Pure Enscapsulations UltraNutrients as my multi bc it seemed very close in ingredients and dosages to Dr. Lynch's seeking health prenatal. But I don't know if I am overdoing it or not. The nurse practicioner and the doctor say all I have to do is take deplin and I'm the same as anybody else. I find this very hard to believe. I also started 600 mg of NAC this week. I'm a bit confused if I am taking the right things. I cannot afford to find another functional medicine doctor becasue this office is the only one that takes insurance. All the other functional medicine doctors I've found do not take insurance, which makes it prohibitively expensive. Do you have any advice about supplementation? Hi Lissen, Each case is personalized and you may or may not tolerate that high dose of methyl-folate. There are many other genetic SNPs besides MTHFR that create the whole picture and determine whether or not a person will do well on that dose of Deplin. I usually "start low and go slow" as a rule to avoid hyper-methylation or side effects. If you are not finding answers with your current doc, it will be well worth it to invest in a doc who can personalize the recommendations for you! I have the defect and high levels of b-12 as well. I am taking lithium orate to release the b-12 into my blood. My question is do I have to take lithium for life or only until my b-12 is normal? Hi, is it possible to hAve mthfr and comt gene mutations? What would be the protocol for that please? Hi Debbie, There is no "protocol" or one size fits all. I recommend consulting with a functional medicine expert to taylor a plan specific for your health needs! Dr. C., I am taking Deplin 15 mg for double hetero. mutations which I take at night. My doc also has me taking a super B complex in the morning and B6 at night. Why would he have me take additional Bs at all, and why split them between morning and night? Do they enhance the function of Deplin? Thanks so much for your ongoing care of those of us trying to figure out how to take care of ourselves. Hi Julie, B6, riboflavin, niacin, and B12 are all essential in the methylation process. So there is more than just methyl-folate in the equation. B6 is essential for seretonin production which is why some docs give at night to enhance mood and sleep. There is no one-size-fits all so see how you do and make adjustments if you are not feeling well on the current regimen. Hello, my husband was today diagnosed with heterogen A1298C mutation. the C677T is ok. how can i get in contact with you to get some hints for the treatment? Hello. I just found out I'm homozygous for c677t. I have had anxiety and depression since I was a little girl. Aspergers and ADHD run in my family as well as bipolar disorder. I have LUPUS and chronic fatigue syndrome. From what I have read it sounds like the 1298 mutation is more likely to cause these conditions, or have a been misinformed? Is my being homozygous for c677t mutation likely causing these problems. Also I was if anybody has ordered the DNA analysis from 23andme recently. Does it provide you with info on gene mutations without the health analysis info or does it not provide you with DNA mutation info at all? Thanks. ksut fond out my 21 month old is ++ MTHFR A1298C. Should i be giving her extra folate? and how much would you recommend?? Hi Megan, with a 21 month old it's important to consult with a physician before supplementing 5MTHFR. I would start with dietary sources of natural folate, like leafy greens. I have been reading about the MTHFR gene mutation lately and will be ordering the 23andme test soon. I have read that birth defects can be a sign that you have it, but never read anything about missing limbs. I was born without my left hand. I also have eczema, PCOS, digestive issues, OCD/anxiety/depression. I've seen many drs post that the heterozygous mthfr combination of 1298 and 677is the worst, yet I can't find any articles that discuss this and why. It sources back to Dr. Jones, the Lyme pediatrician, but then he quotes that on his page with no references. Can you site the article you found this info from? Thank you so much. Hi Nina, You will likely find what you are looking for here http://mthfr.net/mthfr-research/2012/01/27/ under Compound Heterozygous MTHFR Mutations. I believe there are over 4000 articles on MTHFR mutations in PubMed as well. I am A1298C ++ and have sleep disorders. Please recommend a good Functional Medicine doc in Dallas, TX. you can search at www.functionalmedicine.org by zip! hi, if I am GG on the A 1298C and normal at the other one what does that me( Snp´s from 23 and me) so it means CC right? I Heard that was normal but on 23 and me they say its not? Confused!! Hello, could you please advise if there is any risk associated with over supplementation of methyl folates if I haven't been tested. In the part 5 years I have been diagnosed with vitiligo, endometriosis and bladder cancer all of which have assoc with vit Bs. I don't have confidence in being taken seriously by a GP (australia) to request tests for tox, vits, genes. Interestingly my paternal grandfathers 6 siblings all died of Alzheimer's and he died of a heart attack. My maternal grandmother had fibre, cancer and endo, so I am thinking this MTHR could be a factor. Is there a way to naturally manage or does it require supplementation if I inherited two damaged copies of the gene. I need to boost antioxidants to prevent recurrence/progression of these diseases. I want to recommend Dr. Gary Blabey, a Chiropractic physician and Board eligible Chiropractic neurologist and superb doc in the Tysons Corner, VA (DC Metro area) (www.backinactionva.com). He offers comprehensive functional health and wellness solutions and he is unrelenting in his pursuit of continuing education. I have seen him for over 20 years and he has dramatically improved my health and that of my family. I cannot recommend him highly enough. I am an MD, with questions. I have a 30 yr old female with periods twice a month. Has anxiety. Mostly healthy otherwise. Heterozygous c677T. She cannot swallow pills- for love or money! Any suggestions other than the methyl B sublingual? For the MTHF, TMG, other Bs? Any small pills? I tried to break Methyl Guard apart and it is super bitter tasting! Any other thoughts for the periods every 2 weeks. She is not on BCP, and is anxious about taking them- worried about getting blood clots. Any thoughts about testing for her propensity to get them? Hi DH, You might try Prothera Active B12-folate lozenges which would be sublingual for her. She can order using physician code 618 if needed online. For hormones, I would check serum levels of estradiol, progesterone, free/total testosterone, DHEAS, cortisol on days #19-21 of cycle and maybe try Chaste Tree for regulation. My son is 27 and has been dx with MTHFR, he has clots, bipolar, anxiety severe addiction from one to the next etc. I have Lupus, MS, Migraines,Siezures(epilepsy). .I have had cervical dysplasia and cancer runs my family.I had a wonderful Internal med doc and have just lost him,due to political changes, but even he didnt make a connection. Now I have an elderly GP. He knows Nothing about MTHR and does not know anything about MTHR or my treatment and as an RN I am pretty much on my own and have to ask for every labs or changes in meds or care. He has given me refills for the meds I was taking. My previous Dr. had me on MTX methotrexate to help put my symptoms in remission.Yes I had some bad days but it did give me 3to 4 days that were decent a week. It was all a nightmare.so we stopped it.My GP said don"t take ASA and stay on your meds but thats it. There are no docs in town that will take Medicare and I had to stop working due to my disease process and finding some one that will take me due to the medicare then they look at my dx and say no, I don't think so. Thanks for your comments and sorry to hear about your suffering. The best thing to do and you don't even need a doctor for it) is to eliminate all processed foods, gluten, dairy, sugar, soy, corn, alcohol from your diet and start with a foundation of clean organic unprocessed foods. You will be amazed at how much a very clean diet will help your conditions! I got my 23andme results. I do have three MTHFR mutation. Should I be alarmed? Do I need to see my PCP? All of this is very new to me. I'm not sure what my next step should be. Hi Instantn0odle - no do not panic. SNPs are not fatalistic and there is much you can do (start with clean, unprocessed food) to modulate their expression. It depends on your health and just because you have a mutation doesn't relegate you to a poor health outcome. Hi KM - Yes, indeed you need to find a functional medicine trained doc who can listen to your story and help you on the way to healing. There are a few docs trained in Australia and many more in UK and US if you are willing to travel. I suggest searching on www.functionalmedicine.org for a doc near you. Try searching by zip code at www.functionalmedicine.org. Can one have high serum B6, B12 and folate yet actually have a a deficiency? Also, I just rec'd my 23andme results and I am heterozygous for both MTHFR C677T and CBS A360A. I am awaiting an appt with a functional med dr in 2 weeks. Thank you Dr Jill! Is there a specific test for the co-factors? Should one treat MTHFR or CBS first? My 23andme results seem to be a little complex for both my methylation and detox profiles. I have a bunch of homozygous and heterozygous mutations. I pray my doctor knows what to do for all of this! Thanks again! I am homozygous for C677T and my husband homozygous for A1298C. Our eldest son has heterozygous C677T/A1298C and is having treatment for that as he has autism. My question is would my younger son definitely have the same mutations as my elder son? And although he is developing well at the moment he might need treatment to avoid becoming over toxic? Many thanks. if you and your husband each carry 2 abnormal copies respectively of the gene mutation, your sons will inherit one copy of each mutation. I am so glad I found your web page. Dr. Jill you answer most questions with real answers or where to find Dr.'s that can help. My best friend found out she has MTHSERC677T. Her family is having a very hard time trying to figure out what to do for her. She lives in Arizona. I am going to find someone for her to go to that will help her. She is severely depressed. Both my husband and I have MTHFR A1298C heterozygous. If we have children, how likely would they be to have A1298C heterozygous, homozygous, or neither? Jill C Carnahan, MD. Watermark theme. Powered by Blogger.